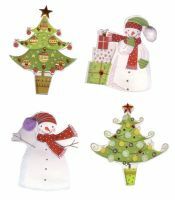 Gorgeous versatile Christmas stamp set with baubles, Christmas trees, stars, snowflakes, swirls and a snowflake border. 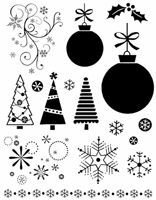 Use the smaller stars and snowflakes to layer a pattern onto a stamped bauble, glitter glue will add a bit of festive sparkle. 18cm x 14.5cm sheet of clear stamps, ready to mount on acrylic block individually, or in a group to your own design, ready for stamping.